Hands up if you're a perpetual breakfast-skipper. I know I am! It takes a lot to get me enthused about eating in the morning, but when I was invited along to an exclusive preview of the breakfast offering at LEON's new store in Oxford, three days before they opened to the public, I couldn't say no! 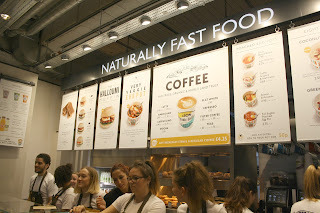 LEON are all about natural, fast food. 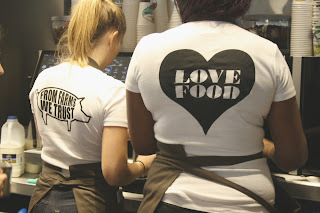 Their vision is to deliver high quality food at top speed, and with a reasonable price to boot! Their menus are nutritionally balanced, with a focus on fruits and vegetables. The company sources its food ethically, supporting environmentally positive farmers. Aside from their authentic Spanish chorizo, all of their meat is from UK Freedom Food approved farms. The eggs that LEON use are free range, and their coffee is fairtrade and organic. 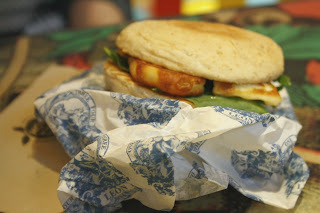 I was really impressed with LEON's ethos and I couldn't wait to sample their grub! Time for the taste test! 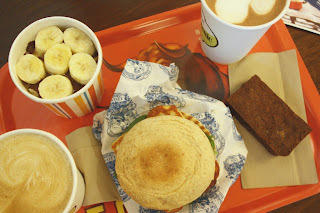 I took a friend along with me to LEON's event and together we sampled the Porridge of the Gods, a Halloumi Muffin, a Better Brownie, and a latte and a hot chocolate to wash it all down. I was incredibly impressed by the quality of the food on offer! Everything tasted so fresh and delicious! 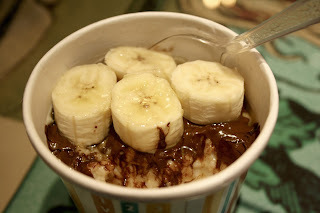 The porridge was not too heavy and perfectly flavoured with organic honey and melted chocolate flakes. The brownie was dense and chewy, just the way I like it, with plenty of tasty almonds and orange zest. The toasted halloumi muffin was served piping hot, with red peppers and LEON's own home-made ketchup! The process from ordering to collecting our food took less than five minutes despite the place being packed with other bloggers and reviewers - impressive stuff! LEON's transparency with their menus is really admirable. You can see all of the ingredients and nutritional information for their items on their website, which really helps you make informed choices about the healthiest options. It's also super easy to eat vegan and vegeterian at LEON - you can switch the milk in your coffee for a dairy-free alternative, and you can even opt for almond milk in your porridge. Options that are wheat free and gluten free are also plentiful, so whatever your dietary requirement, LEON can cater for you! 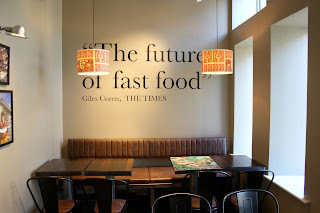 Another aspect of LEON's restaurant in Oxford that I really like is their decor - it definitely doesn't feel like a fast food joint, there is more of a restaurant vibe! There is ample comfy seating both upstairs and downstairs, with funky, well-thought-out decor which makes you feel right at home. 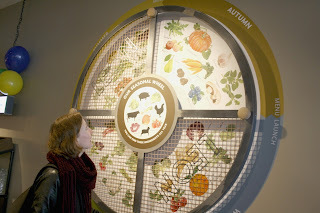 One of my favourite features is the seasonal food wheel which we found upstairs. This tells you exactly which fruits and veggies are in season when you visit! I should also mention the customer service at LEON, which was second to none! My friend and I really struggled to decide what we wanted to try from the extensive menu, but the girl behind the coutner was so patient with us, asking us what kind of flavours we like and suggesting her favourite menu items. Service with a smile really makes a difference when you're dining out, and we couldn't have been made to feel more welcome at LEON. 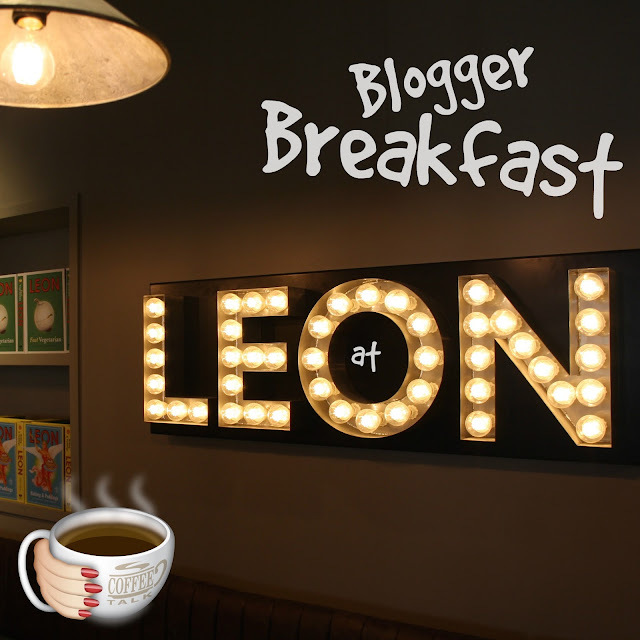 I thoroughly enjoyed my breakfast at LEON and I'll definitely be back to sample their dinner menus too! 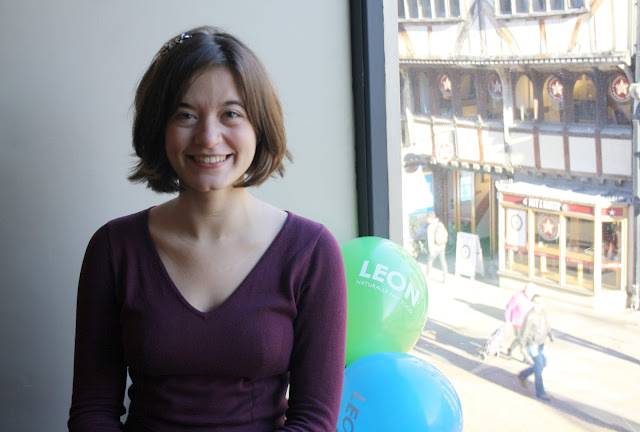 You can find LEON's Oxford store at 44-46 Cornmarket Street, Oxford, OX1 3HA, right in the city center. Have you ever eaten at LEON? What is your favourite thing from the menu? Please share in the comments below! *Disclaimer: The meal detailed here was provided free of charge by LEON in exchange for a review.